SSgt. Stephanie Grebe, 412th Security Forces Squadron, tends to a victim of a simulated shooting Aug. 1, 2016, at Bldg. 2850. The 412th Medical Group has a moulage team who dressed up wounds on 22 actors for Exercise Desert Wind 16-05. The scenario for this exercise was an active shooter who shot 22 people and killed 13. 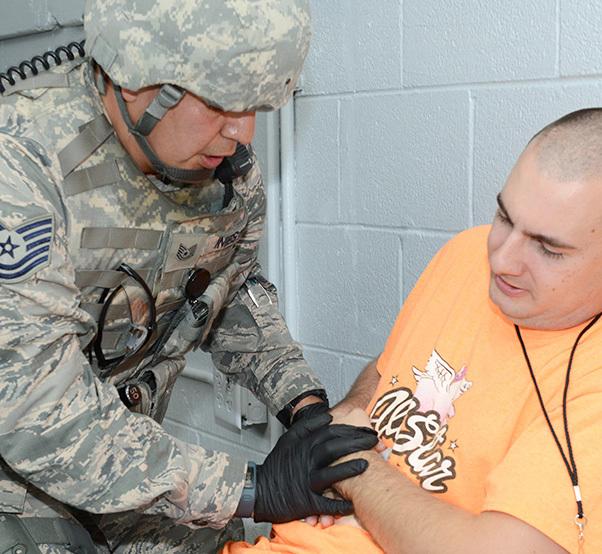 On Aug. 1, defenders from the 412th Security Forces Squadron responded to Bldg. 2850 at Edwards Air Force Base, Calif., after a report of shots fired, what they arrived to were people screaming and a mass shooting situation leaving carnage everywhere. Edwards AFB kicked off the month of August with Exercise Desert Wind 16-05. The training exercise was conducted to test the entire base’s response capabilities to include security forces, medical response, command communications and lockdown procedures across Edwards. In the all-too-real scenario, a “self-radicalized” disgruntled employee decided to attack personnel at Bldg. 2850 where the 412th Test Wing Inspector General’s office is located along with base legal counsel and union offices. 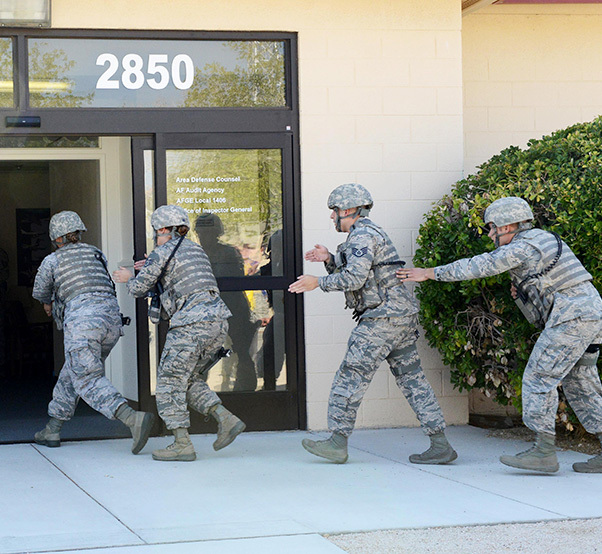 Members of the 412th Security Forces Squadron storm Bldg. 2850 looking for an active shooter during Exercise Desert Wind 16-05 Aug. 1, 2016. In all, 22 people were shot and 13 killed. The shooter committed suicide at the scene. As with every exercise conducted here, the situation and response is made to be as real as possible, with the “wounded” and “dead” players displaying gruesome injuries thanks to the moulage team from the 412th Medical Group. Following the initial response, Edwards AFB’s Emergency Operations Center personnel were called into action along with the Crisis Action Team. The wounded personnel were evacuated from Bldg. 2850 to be treated by the Edwards AFB Fire Department in a makeshift triage area in the parking lot. However, another scenario was thrown into the mix with the discovery of a bomb in a nearby truck. 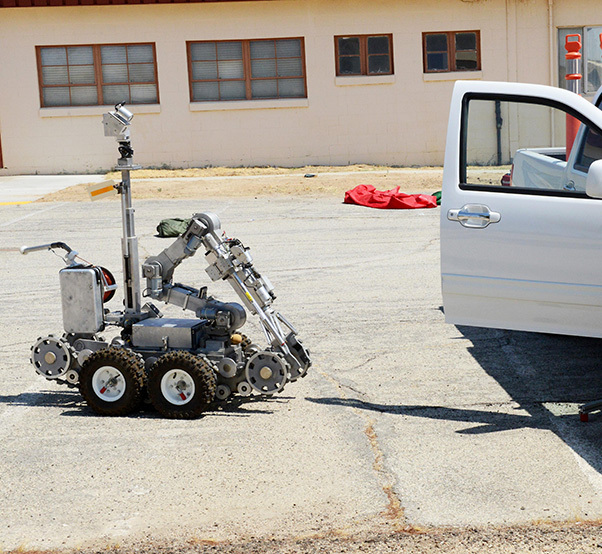 Both patients and firefighters had to evacuate the area while Edwards AFB’s Explosive Ordnance Disposal team were called in to disarm the fake bomb using one of their robots. TSgt. 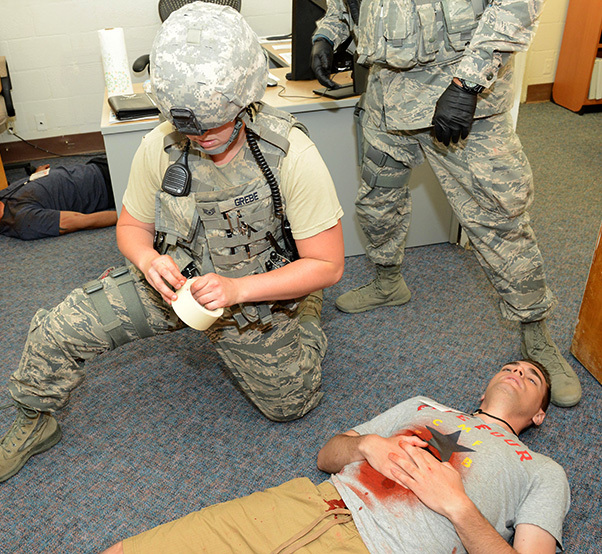 Ismael Iniestra, 412th Security Forces Squadron, tends to a “wounded” victim at Bldg. 2850 during Exercise Desert Wind 16-05 Aug. 1, 2016. Edwards partnered with Palmdale Regional Medical Center off base where they conducted their own training by accepting two van loads of wounded personnel from the base. They were treated in the hospital’s emergency room. 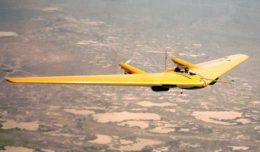 Edwards AFB tries to conduct emergency exercises four times a year involving different scenarios including plane crashes, natural disasters and terrorist attacks. 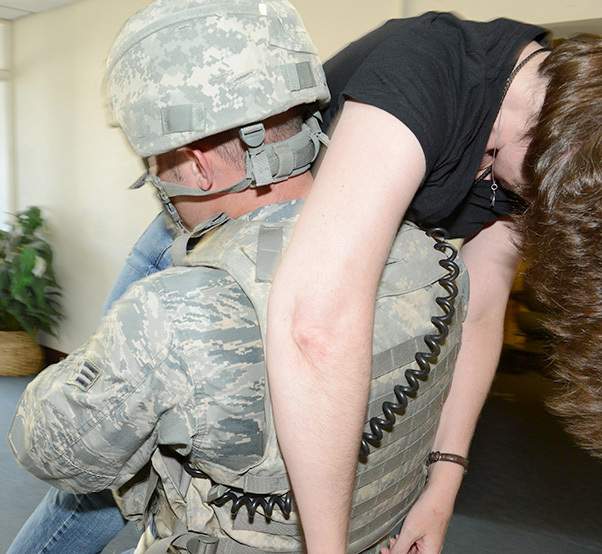 A 412th Security Forces Squadron Airman removes a “wounded victim” from Bldg. 2850 Aug. 1, 2016. 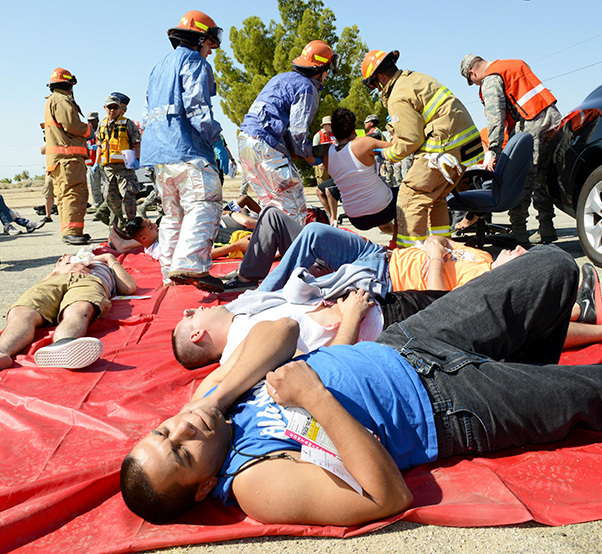 Exercise Desert Wind 16-05 tested the base’s emergency response to an active shooter scenario. Officer Kevin Barandes escorts a victim out of Bldg. 2850 after a simulated active shooter attack Aug. 1, 2016. Victims are treated in the parking lot of Bldg. 2850 where a makeshift triage station was set up to treat the wounded. 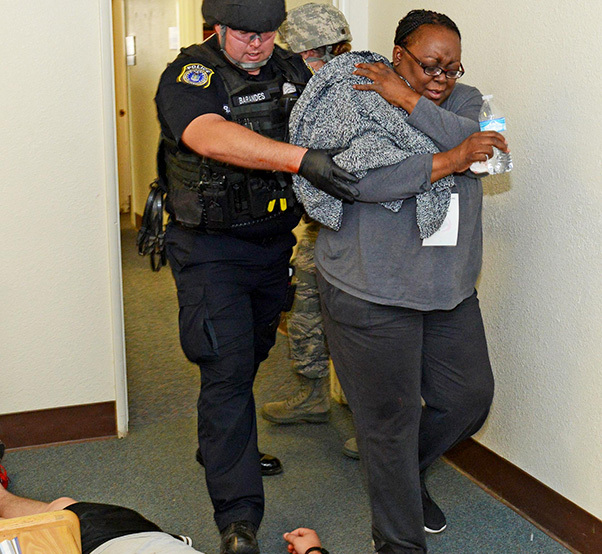 Exercise Desert Wind 16-05 tested Edwards AFB’s response to an active shooter scenario. 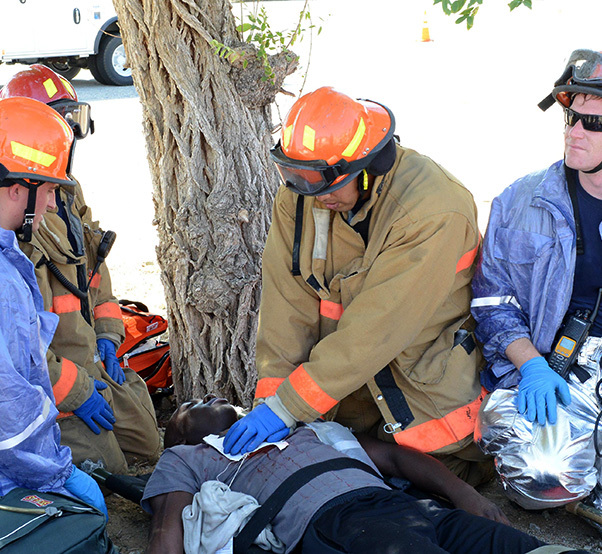 Edwards AFB Fire Department treats a “wounded” patient under a tree after being removed from Bldg. 2850 Aug. 1, 2016. Exercise Desert Wind 16-05 tested the base’s response capabilities to an active shooter scenario. 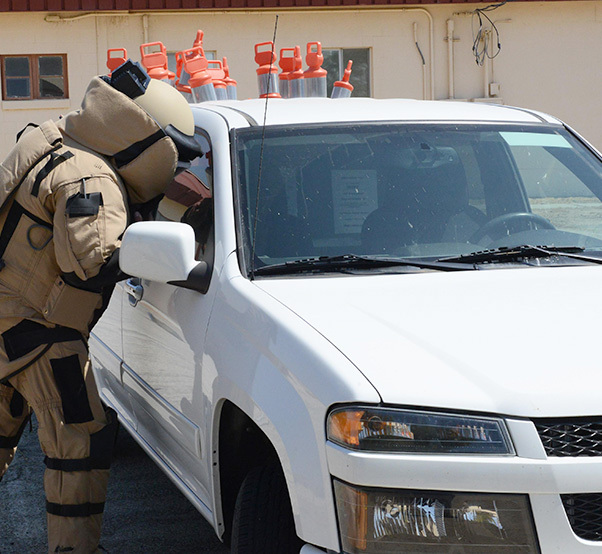 Edwards AFB Explosive Ordnance Disposal was called in when a simulated bomb was discovered in a pickup truck during Exercise Desert Wind 16-05 Aug. 1, 2016. Their bomb robot was sent in to investigate. An airman from Explosive Ordnance Disposal investigates a pickup truck with a reported bomb in it outside of Bldg. 2850 during Exercise Desert Wind 16-05 Aug. 1, 2016.